River-boarding is arguably the most fun you can have on class III whitewater! Why? Because it's easier to learn than kayaking and more fun than rafting! Imagine riding on a super-stable board up and over th waves, using dive-fins to propel yourself through class III ("intermediate") rapids like riding a magic carpet. With a 30-minute safety-talk and orientation to riverboarding, river dynamics and leg-kicks, we'll have you riverboarding in no time! River Boarding in Pilar NM from Nina Perea on Vimeo. 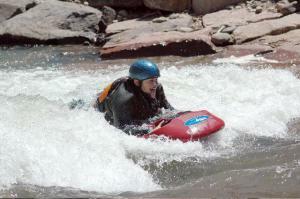 River-boarding season is limited in New Mexico, so join us while there's still openings. Each trip is limited to 5 participants to ensure the proper student - to - guide ratio. Currently there are no Intro to Riverboarding clinics scheduled. Please see our Calendar of Events for upcoming Intro, Roll, Whitewater and Touring clinics, or Contact Us for a private lesson.